The LR3300 combines a wide output (up to 1250 V and 62.5 A) with high accuracy (450 ppm or 0.045%) and high stability (100 ppm or 0.01% for one hour). For larger current outputs, up to 180 A can be obtained by synchronising the outputs of multiple units. For the calibration of 3-phase power meters, it is possible to synchronise the outputs of two or three LS3300 instruments using master/slave connections. Other features include the capability for direct calibration of the current sensor inputs of a clamp-on power meter using the instrument’s auxiliary output, and notification of when the output becomes stable to maximise the accuracy of the measurement. 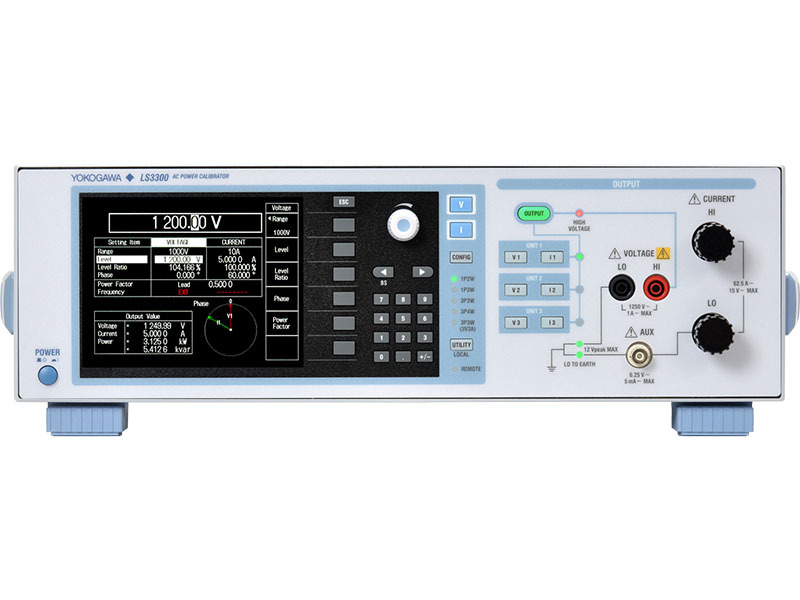 The LS3300 is based on the core technology of Yokogawa’s AC calibrator, the 2558A, originally released in 2013. Calibrating power meters with the 2558A, however, required two separate 2558A instruments plus a reference power meter, whereas the LS3300 combines these functions in a single instrument to satisfy the calibration needs of lower-accuracy power meter users. All power meters and analysers need calibrating to confirm their performance and to satisfy the requirements of quality systems such as ISO9001. As a dedicated instrument for calibrating lower-accuracy power meters at commercial mains frequencies and up to 1.2 kHz, the LS3300 offers a cost-effective solution for users who need to calibrate higher volumes of power meters. These potential customers for the LR3300 include accredited calibration laboratories, private calibration companies, companies that manufacture measurement instruments such as power meters, clamp power meters and smart meters, and calibration divisions and repair service divisions of companies that use power measuring instruments in production line testing. At the top end, where the highest accuracy is required and also where the application consumes power at frequencies higher than 50/60 Hz, an ISO 17025 accredited calibration at higher frequencies is required to prove the performance of the power analyser for the application, and thus to validate the instrument for compliance testing and, for example, where very small improvements in efficiency are being pursued. As the first non-governmental ISO 17025 accredited laboratory to offer power calibrations up to 100 kHz, the Yokogawa European Standards laboratory in the Netherlands, with world leading measurement uncertainties, carries out calibrations to the highest standards. An LS3300 can therefore be delivered with an accredited calibration enabling it to be quickly incorporated into a customer’s quality system.